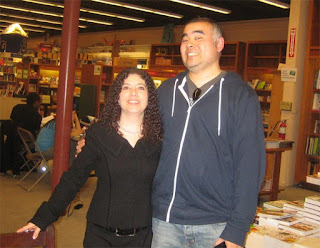 Jodi Reamer is an agent at Writers House, she has a lot of amazing clients, but I think we can all agree our favorite client of hers is Dan Santat. Lin asks what sort of an agent are you? I'm akin to a manager, I'm looking to represent somebody for a whole lifetime. It starts from helping you edit your manuscript before we submit to editors, to negotiating the deal, to looking at covers, to making sure you are happy with marketing and publicity, to subrights, I'm a full-service agent. And that's fun for me! "I want to help you constantly grow, and get to where you want to be. When I take someone on I want to know all of the things you want to write." Lin asks the agents how many clients they have and how much time do they spend with/on each one? Jodi's reply, "When I take you on, I am making a promise to you that I will always have time for you." Just like you hone your style as writers and illustrators, Jodi has honed her style as an agent, so to submit to her you should appreciate her style, advice and sensibilities, or it probably won't be a good match. What's fantastic about our market, Jodi says, is it's always changing. YA has exploded, but she thinks middle grade is about to have its moment. But you never know what's next, Jodi acquires great manuscripts with characters she loves more than she's acquiring something that will fit a trend. Market-wise, Jodi is looking for a book that a publisher can go big with, a book that will make a splash, because it's harder these days for publishers to compete against Amazon as well as to get the attention of the reader who is inundated with a glutted book market. Big doesn't mean incredibly high concept, "big" to Jodi means it's a book that's going to have lasting power and be special enough to rise above the common manuscript, something special.